She was speaking of a journey that many here in this West African nation have sought to go on in the hope of making a better life for themselves and their families. But it entails embarking on a route of irregular migration reportedly fraught with danger, trauma and abuse. 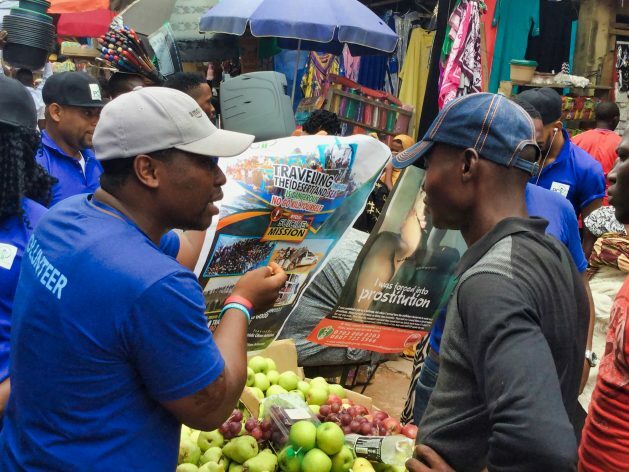 But in an ironic twist of fate, many young Nigerians who have attempted the irregular travel to Europe, through the Sahara Desert and across the Mediterranean sea, are back home and campaigning against the practice. Known as Volunteer Field Officers, VFOs, a group of 15 returnee migrants are working with the International Organization for Migration (IOM), under its Migrants as Messengers (MaM) Programme in Nigeria. These VFOs were among the Nigerian migrants the IOM brought home from Libya and other transit countries under the European Union-IOM Joint Initiative For Migrant Protection and Reintegration. Since the beginning of the project in April 2017 more than 11,500 migrants have been returned home after their failed attempt to reach Europe. It includes a series of messages and videos posted on social media, interviews on community radio stations, and community screenings of a movie on irregular migration. The campaign has also taken place in the media, at schools and in public places like on busy highways and markets. The Uselu campaign starts with the female VFO addressing traders and customers in the market over a public address system. She tells her audience that irregular migration through the desert to Libya and then over the Mediterranean sea to Europe is highly dangerous and no one should undertake it, irrespective of the hardships they face at home. But the market turns rowdy when she criticises the widespread practice in Edo State where poor mothers encourage their children to embark on the dangerous journey, hoping that they will earn a lot of money abroad to lift their families out of poverty. Edo is the Nigerian state with the highest incidence of irregular migration. Data gathered from the IOM under the EU-IOM Joint Initiative, shows that about 50 percent of migrants returned from Libya under the initiative since April 2017 are from Edo State. It is here that the VFOs are most active, many times going the extra mile to ensure a successful campaign. And it is what they do now in Uselu market. “Many of our mothers here, some of them have sent their children to the Libyan route, it is bad, you should advise yourselves because there is nothing in the Libya route,” the female returnee migrant says. But angry women shout her down and engage the VFO team in a war of words. They insist that irregular migration has become inevitable in the face of the economic situation in the country, which has left many families extremely poor. In 2017 the country began recovering from the worst economic recession in a quarter of a century. But rising inflation, and a slowdown in the oil sector are among the contributors to a sluggish growth. “Many of the good houses in Benin [City] were built with money sent home by those who went abroad through Libya,” one woman says. Another argues that it is unfair to ask people not to travel to Europe through the desert and the sea when they are not allowed to travel by air. Such deep support for irregular migration from parents account for the widespread practice of it in Edo State. This and the long history of irregular migration in the state, which started in the 1980s following a downturn in Nigeria’s economy, makes the work of the VFOs challenging at times. But the personal stories of the VFOs remain an effective tool in their campaigns. They are also armed with posters and handbills that illustrate their near-death experiences when they attempted the journey to Europe. VFO Jude Ikuenobe says when confronted with a situation similar to the one faced at Uselu Market he always tells people about his imprisonment in Libya. He supports this by showing people photos, taken shortly after his return from Libya, of how emaciated he was due to his imprisonment. He also tells people how his friends died while crossing the Sahara desert and the Mediterranean sea. Because traditionally people from Edo State are buried near their loved ones, Ikuenobe often tells people how sad it is to die in a place like Libya or how tragic it is to have their bodies thrown away in the desert, rather than being buried by their loved ones at home. He says when people hear his first-hand experience and see his photographs they often become discouraged to attempt irregular migration. The VFOs use their new communications skills with good result at the Uselu market. A tensions soon calm down after people see the photographs, posters and handbills. Some people in the market even feel safe enough to share their own stories. One lady admits her young, beautiful friend drowned at sea as she attempted to cross from Libya to Europe. One man, Chinedu Adimon, says two of his friends also drowned making the same crossing. “One of them had two young daughters,” he recalls. Many in the market whose relatives have embarked on irregular migration, and whom they have not heard from since, are sobered by the reality of the dangers. They wonder what could have happened to their loved ones. Pius Igede bursts into tears. He says his daughter recently made the irregular journey to Europe and he does not know her whereabouts. “She only made a phone call that she is out of the country. I don’t even know where she is now, whether it is Libya or any other place I don’t know,” he explains. He adds that he suspects some of his other children are planning to travel to Europe as well. And for him, the VFO’s posters and handbills may be the saving grace to convince them to remain at home. Osita Osemene of the Patriotic Citizen Initiatives, a non governmental organisation campaigning against irregular migration, says the VFOs were able to convince people in the market about the dangers of irregular migration because they have first-hand experience. “It would have been very difficult to convince anyone in the market if the VFOs were just ordinary people who had no experience of irregular travels,” says Osemene, who is himself a returnee migrant. He explains that lack of information about the true impact of irregular migration is a serious problem as many people assume those who attempt the dangerous journey to Europe actually arrive there and attain success. “They were surprised when we showed them some of the things people go through, how people cross the sea in boats that can easily sink,” he says. Ikuenobe says as VFOs they are working to close a vital information gap. “So many mothers are not educated, so many mothers are desperate to see their children succeed, but we have to make them understand that irregular migration would not bring success,” Ikuenobe says. For Patsanza the performance of the VFOs at Uselu Market shows how effective they can be in the fight against irregular migration. Ikuenobe says the campaign is being conducted continuously in order to educate as many people as possible.